Laravel is an open-source PHP web framework. It was created by Taylor Otwell. 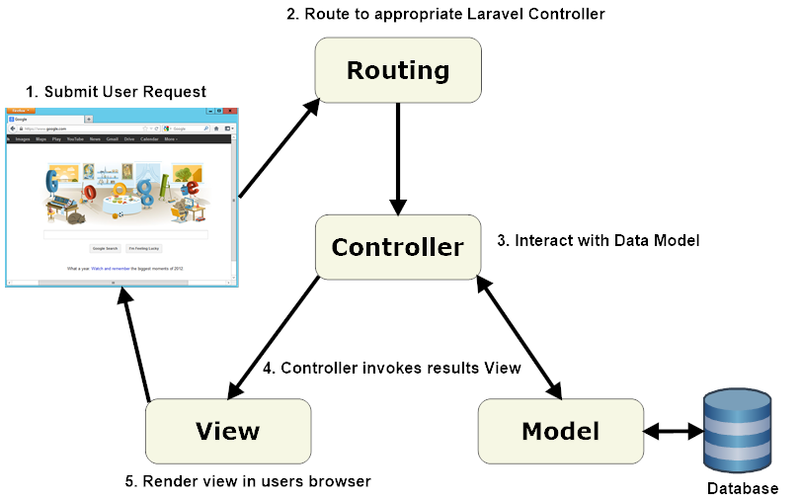 It follows MVC architectural pattern for the development of web applications. It is based on Symfony, a set of reusable PHP components. Taylor Otwell released the beta version of this framework was released on June 9th, 2011. He created Laravel as an advanced alternative to the CodeIgniter framework because CodeIniter did not provide features like built-in support for user authentication and authorization. The source code of this PHP framework is hosted on GitHub. It is licensed under the terms of MIT License. The latest version of this framework is Laravel 5.6 which was released on February 7th, 2018. If we are going to develop a website from scratch, Laravel saves a lot of time. It offers a rich set of functionalities which incorporates the basic features of PHP framework. Moreover, a website built in this PHP Framework is secure and prevents several web attacks. Scalability: It follows MVC pattern that makes the web application development more scalable and pragmatic. Reusability & Time Saving: It reuses the components of other frameworks at the time of web application development that saves a lot of time. Organised & Managed Resource: namespaces and interfaces helps in resource management. Laravel Installation | How to install Laravel? Go to https://getcomposer.org/download/ to download composer. Step2: Go to command prompt> type Composer to check the installation. Step5: Copy the underlined url and paste in the browser. If Laravel screen appears, that means it is installed successfully. Easy Development Process: This framework makes web development process quite easier. It complete the web project development very fast. MVC Support: it supports MVC Architecture like Symfony, ensuring clarity between logic and presentation. Authorization: Laravel provides a simple way to organize authorization logic and control access to resources. It uses “Blade Template Engine” that speed up compilation and saves time at the time of development. It uses “Bundled Modularity” for code reusability. Increased Website Traffic: This technology increases online traffic in your website. It is applicable on any browser and device as well. Simplify the Website: It includes so many flexible features to your applications. It also uses the modular packaging systems that will help to simplify the website. Laravel can create unique URLs so we can create different routes with the name of same existing route. It has many advanced features like checking active users, Bcrypt hashing, password reset, CSRF (Cross-site Request Forgery) protection, and encryption. No Special inclusion paths & maintenance: It contains an auto loading facility because of which the PHP does not need special inclusion paths and maintenance. Security: It uses Bcrypt hashing algorithm for generating an encrypted representation of a password. Laravel uses prepared SQL statements which make injection attacks unimaginable. It provides a simple way to escape user input to avoid user injection of <script> tag. Low Community Support: Laravel is a new PHP Framework. It does not have wide community as well. So, new user faces problems while extending classes and codes. Many methods included in reverse routing are complex. There can be some bugs because it is still being developed compared to other PHP frameworks like Symfony. An artisan is a skilled craft worker who makes or creates things by hand that may be functional or strictly decorative, for example furniture, decorative arts, sculptures, clothing, jewellery etc. It is a PHP Framework that allows its developer to build feature enriched, secure and scalable websites and applications within limited time bound. It enables developers to provide quality product to its clients even in a short time period to ensure long term relation with clients. Developer can easily achieve design and development goals with small efforts. It also allows to improve user experience with low efforts without any compromise in security. It makes Web Development easier and also improves appearance and readability of your web application. For more informative and technology related blogs, keep visiting our Tech Blogs. Anyway I will be subscribing it to come again.